This cool space wallpaper shows ESO Very Large Telescope image of the planetary nebula Fleming 1 in the constellation of Centaurus (The Centaur). This cool space wallpaper shows an ESO Very Large Telescope image of the planetary nebula Fleming 1 in the constellation of Centaurus (The Centaur). 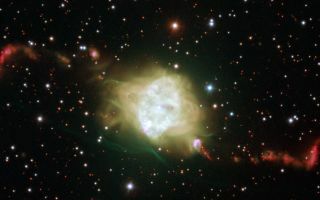 New observations suggest that a very rare pair of white dwarf stars lies at the heart of this object, with their orbital motions explaining the nebula's remarkably symmetric jet structures. Image released Nov. 8, 2012.